Last night, as my kid-shuttling schedule once again precluded me from hitting the Presbytery meeting. A multi-hour weekly rehearsal on Tuesday nights requires my presence. At the height of rush-hour, on the other side of DC, I just can't manage the both. Over the last year or so it has made getting out to the big collective gatherings consistently impossible. I read the pre-meeting materials, of course, keeping up with who is going where and who is arriving. I track my way through the different materials, which are generally well put together and useful. I've never been a big fan of meetings. No. Wait. Scratch that. I actually rather like a productive meeting. I can't stand going to meetings where my presence seems to add little value. Worse still are meetings that lurch and grind and spiral, or that stretch you out on a rack of time, or that drip endlessly on your forehead like parliamentary water torture. Surely, surely, there's a section in the Geneva Conventions about such gatherings. In my little church, Session meetings are short. Never more than two hours, not ever. If there's an issue that we can't figure out in that time, then we need to step away, and give it more thought. As moderator, this is my stated goal. It's night. People are tired, or they will be. They have lives, and my task is to insure that those lives are in balance. We have stuff to do, and I expect folks to do it because they see value in it and want to get it done. 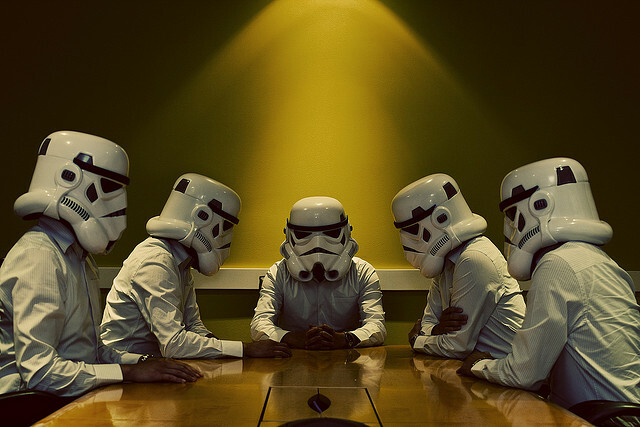 Meetings, after all, are not the Thing Itself. They are not, as painful as this reality is for Presbyterians to admit. Worship is. Service is. Fellowship is. Learning is. Meetings, while necessary, are to the reality of community what the process of digestion is to connubial hanky-panky, or what neural firings are to the choice to throw that life preserver. Meaning, they are absolutely necessary, up to a point. Without digestion, one has no energy for...um...that. Digestion is essential. But if all your energies are turned towards trying to deal with that Bacon Triple Whopper with Cheese that's heaving its way through your innards, ain't no Barry White playing. So to speak. Similarly, when you see that person struggling in the water, there are a set of decisions that need to be made. That has to happen. Calculations about trajectory, made by the ephemera of sentience dancing across individual neurons? Those must occur. But if the process stretches out, and there are motions amend the amendment to the motion to throw the preserver at a forty three degree angle at a velocity of seven point three feet per second, then nothing happens. Other than a faint burbling sound from the water nearby. Be decent and orderly, sure. But in the doing. My last session meeting ran for just under fifty minutes, for example. We fired up a tick after seven, and were done by eight. Everyone reported in on what they were doing. There were a few action items, duly discussed and dispatched with motions and seconds and ayes. It was decent and orderly in the way that small fellowship gatherings can be, meaning there was conversation and banter and some laughter as we trundled our way through the agenda. It was pleasant, and it was brief, and we got done what needed to be done. This you can do with a half-dozen souls, all of whom know one another. It is considerably harder when there are over a hundred, and there's complexity, and the ground of mutual relation and understanding is more tenuous. There are political dynamics, and turf, and all other forms of mess. I know how hard this can be, and it's a burden that often rests heavy on the shoulders of those who struggle dutifully to move such gatherings forward. Looking at my son's schedule, it seems that Tuesday might be opening up again in the Fall. Back into the breach, I suppose.